One of the baking surfaces that Slice has really raved about is the Baking Steel. My understanding is that steel has similar thermal mass to a stone, but has much greater thermal conductivity, and so can move heat to your pizza much more quickly than a stone. This results in more oven spring (i.e. water in the dough vaporizes more quickly, creating more bubbles and pockets in the dough) yielding an airier crust with greater char. Of course, if you click the link to this particular product, you’ll find that it costs $75. That’s quite a bit more than I would venture to spend. Much like I eschewed a pizza stone and opted for quarry tiles, I decided that instead of shelling out for a Baking Steel I would simply buy a plate of hot-rolled A36 steel and adapt it to my purposes. Despite living in a city with no shortage of metal fabricators, I had a bit of difficulty finding someone to sell me the steel at an agreeable price. I emailed about ten fabricators, and only three responded – two to say that they could not roll or cut steel as thick as I wanted and one fabricator trying to charge me $100 for the plate. Many fabricators offer great prices online, but shipping steel is expensive on account of its weight (about 15 pounds for a 1/4″ thick plate measuring a square foot). I could’ve continued to call around New York until I found someone to do the job, but I found a shop online called Metal Supermarkets that has a location in Albany that quoted me for $24 for a 1/4″ plate measuring 16″ square. A 3/8″ thick plate is only $17 for a square foot, but custom cut plates in larger sizes were closer to $40. Since this could all fail, I wanted to stay in the $20 range, so I decided to sacrifice some thermal mass (thickness) for a larger target for landing the pizza in the oven. I bought $1 bus tickets to and from Albany from Megabus months in advance, and have finally made the trip and acquired that 16″x16″x1/4″ plate. After cleaning, it’s looking pretty good, but definitely not commercial. If quarry tiles don’t bother you, this probably won’t either. As far as kitchen equipment goes, it’s not a pretty thing, though it is free of rust. All day as I handled it during the return trip, it turned my hands a sooty black. I wiped it down very carefully with a few paper towels, and then gave it a wash with soap and water, and soon enough I could run a paper towel over the surface with as much pressure as I could muster without drawing off any grease or dust or anything else. If your steel is coated with oil or grease, remove it with alcohol, soapy water, or another solvent appropriate for the job. There is a layer of mill scale on all hot rolled steel that gives it a dark blue-ish tint on the outside. Depending on your definition of mill scale, it may or may not be flakey/scaley. If the mill scale is flakey, you should consider removing it. Otherwise it is not necessary to remove the mill scale. Either way, it can be done with acid. Muriatic and phosphoric are readily available and extremely effective, but they are unpleasant to handle because of their smell and highly caustic nature. If you use them, use them outdoors. Acetic acid or vinegar is also effective, and is more commonly used. Just completely immerse your plate in vinegar for no longer than 24 hours (I’ve heard of people soaking for 6 to 12 hours on average) to reduce the risk of corroding the surface. Scrub off the mill scale with a rough surface (I’ve heard advice to use a sponge or medium to fine grain sandpaper) while still holding the plate immersed. Once you remove the plate from the vinegar, quickly neutralize the acid with baking soda (I’ve read 100g per 4 liters water works) or ammonia (the amount found in household cleaners like Windex should be sufficient) or some other weak base. Some people simply pop the plate in the oven to evaporate all the moisture on the plate. Removing the mill scale is not only unnecessary, but may be a bad idea if you live in a humid area. The mill scale is an oxidized layer of steel that protects the plate from rust. Once you expose the steel under the scale, it will be susceptible to rust, and will start to rust immediately if the plate has acid on it. 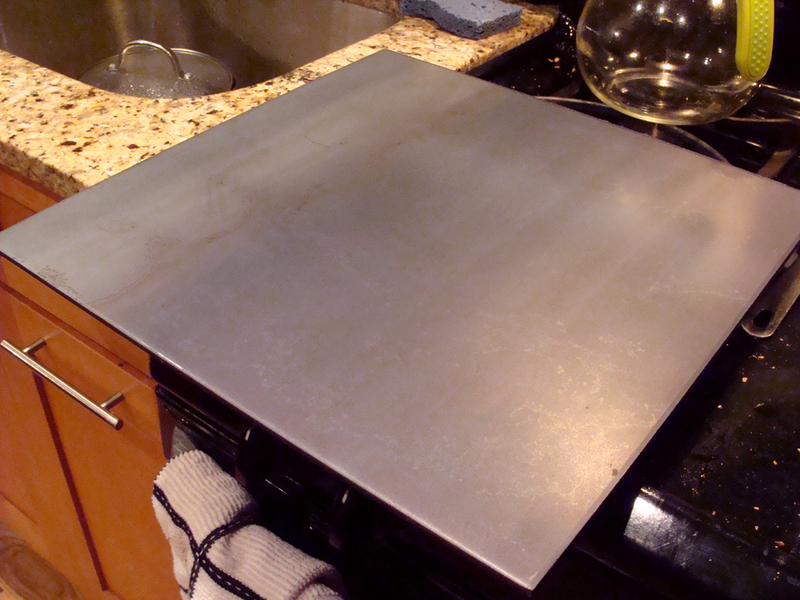 To protect the plate from rust once the scale is gone, you can coat the plate in a cooking oil. However, all cooking oils have smoke points below 550 degrees F, which is the maximum temperature of my oven and where I plan to heat my plate to. While the oil may protect your plate, it may also create smoke or foul smells if it starts to burn. Therefore, consider carefully before removing the scale whether or not it’s worth it to you to shorten the lifetime of your steel or subject yourself to the possibility of burning oil just to get the mill scale off. Rust should be removed. You can remove rust with acid also. If you are not successful with vinegar, step it up to phosphoric (available under the name naval jelly). Alternatively, don’t buy a plate with rust on it. All in all, as long as there is nothing coming off the plate when rubbed, there is no visible rust, and the plate feels smooth, then it is safe to cook on. At that point, there is only an oxidation layer left, and that is perfectly safe. Fortunately for me, my plate had neither rust nor scaley oxides on it, so it just needed more typical cleaning. It took some time to figure out the right balance between broiling and baking. After launching the first pizza with the broiler already turned on, I ended up pulling it out of the oven in about three and a half minutes! It was a little underdone, but I was nervous about burning in some spots. I started to turn on the broiler after two or three minutes, when I could see some color developing in spots on the crust, resulting in pies two and three being a step up. On average the pizzas took about 5 or 6 minutes to cook. At this stage it’s becoming clear to me just how much learning I have left to do about pizza making. These pizzas were good, but the looks were better than the eating, at least to my taste. The crumb was open and airy, but slightly less chewy than I prefer, and the crust had some nice sparse char, but I felt it lacked crispness or crunch. Additionally I’ve been having difficulties lately with dough stretching and launching the pizzas off the peel. It seems that I’ll have to spend a lot of time with recipes to figure out how to get the mechanics as well as the eats to come out to be exactly how I like it. That said, if the results continue to be this good when I make pizza that isn’t exactly how I’d like it to be, I think things will be alright. This wasn’t a bad night of pizza by any stretch of the imagination. In fact, I’m excited to have improved so much in the last few months during my exploration of new dough recipes and baking surfaces that I can now see a bit more of what I still have to learn. Hopefully on the docket for the future will be recipe refinement for various styles, trying to perforate my pizza peel, and hopefully upgrading my make surface from a baking sheet to something like a granite or marble tile. 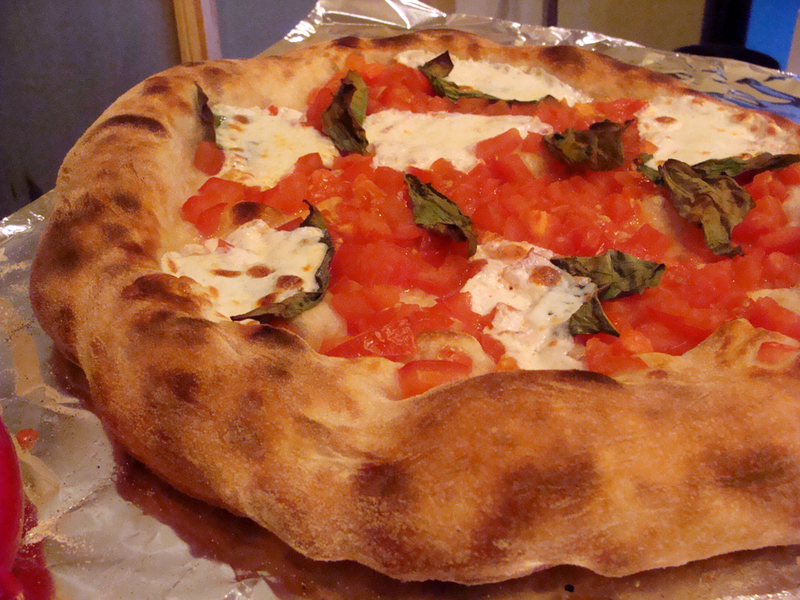 This entry was posted in equipment, learning, pizza on April 25, 2013 by Dylan Bargteil. That’s a great story about traveling to Albany to get your knock-off baking steel. I’m a pastor in Troy, NY and last Wednesday (July 3rd) decided to do the same thing! Only it was way too hot to cook inside, so I wanted two steels. One to put in the oven, and one to put in my Weber Q200 gas grill. I drove a 1/2 mile to a local metal fabricator, and the guy in the shop said I needed to talk to Vinny upstairs. It was about 3pm and the guy said they were on “shut down” until the following Monday due to the 4th of July holiday. I went up to see Vinny and his two kids were running around the office crazy excited because dad was coming home soon. Well anyway, Vinny said he would cut me two pieces of 1/4″ plate (16″X14″ and 16″X19″) for 50 bucks. I think he just wanted to get rid of me. I didn’t tell him what I was using it for, just that I had a problem, and could he help me. I’m sure he thought I needed it at the church to mend a broken left-handed smoke shifter or some such. I said OK and he said there was nobody to do the paperwork and he was going home and that I could come back and pay on Monday. I said OK and went down and said hello to Abraham who was cutting the steel for me. He wanted to know if I worked as a guard in a prison back in 2002 when he was in the joint. I looked familiar. I said no, but I was a guard in a prison in Pennsylvania back in 1970. Abraham said he was only a year old at the time and hadn’t gotten in trouble until he was older. I gave him a $5 tip and left with my steel plates. When I got them home I washed them with mineral spirits. I read the same stuff you read, and decided that surface cleaning them was all that was necessary, (I think the proper way to remove the mill scale is sandblasting and that was not in the cards). I did clip the corners, grind down the sharp edges, and generally smooth everything out before I put them to use. We had friends and fam over for the 4th and I made about 6 or 7 pizzas on the grill. 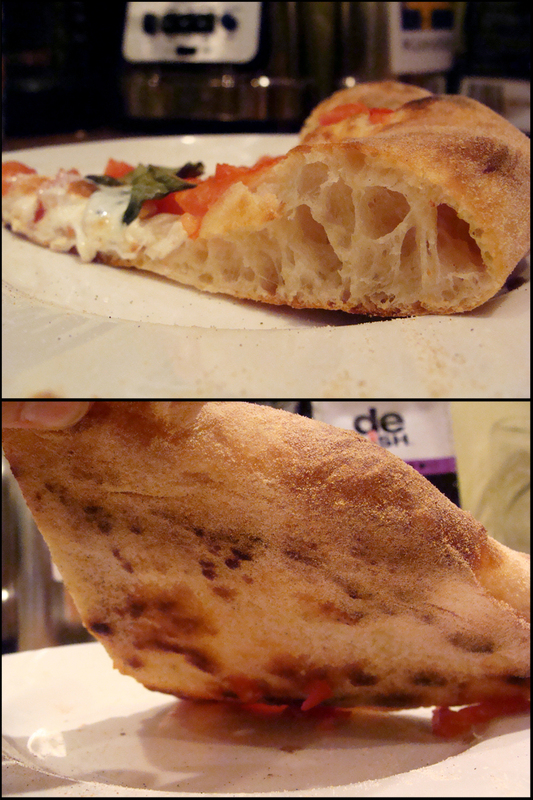 I stretched out the dough and put it on parchment paper. Then I put the paper and dough on a peel, and rolled the dough out to about 12″. I slid the parchment and dough on to the grill and after about a minute I pulled the paper out and put the lid back on for a couple more minutes. I flipped the crust, put it back on the peel, and put the toppings on (tomato sauce, fresh mozzarella, salt, olive oil – some got pepperoni). We had fresh basil, sauteed mushrooms and green and red bell peppers to put on at the table. Then I put the pizza back on the grill and let them cook for a few minutes. They came out great! It was really hot on the deck and I was soaked by the time I was done. But the air was on in the house, and everybody was happy. Grilled pizza ain’t the same as oven pizza, but I wasn’t going to turn on the house oven to +550! Grilled pizza is still pretty good though! Funny thing. On one of the pizzas I forgot to flip the crust before I put the toppings on. So I turned on the gas oven top broiler and stuck the pizza on the steel plate close to the broiler and broiled the top of the pizza. Worked like a charm! Can’t wait to do the whole thing properly in the house oven with a preheated steel and the broiler on! Hope you and your baking steel establish a wonderful relationship. Albany and Troy must be just the right place to get a deal on a baking steel. Pizza and beer. Yes indeed. Blessings to you. I’d really like to try grilling pizza someday. I have seen pictures of people getting great results from grills with modifications like steel plates. I’m glad it worked for you. Right now my steel and I are taking a break from each other for the same reason you went to the grill rather than the oven; I am loathe to fire up a 550 degree oven in my (often) 80 degree apartment. Instead I’ve lately been making pies in a pre-heated skillet and then putting that under the broiler. It really keeps down the heat, and while it doesn’t provide the best possible results, the pizzas are consistently good.